When visiting Walt Disney World it can be overwhelming. All the rides. All the food. All the shows. All the experiences. So often the time spent at the parks can become rushed and the little magical moments of the theming can be missed or overlooked. 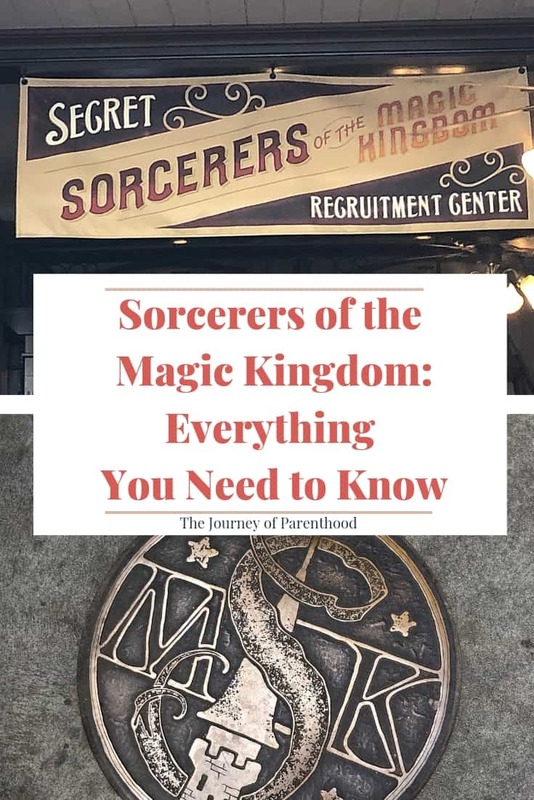 Our family has visited Disney World countless times yet we have never taken the time to play Sorcerers of the Magic Kingdom. I hadn’t even heard about it until recently! 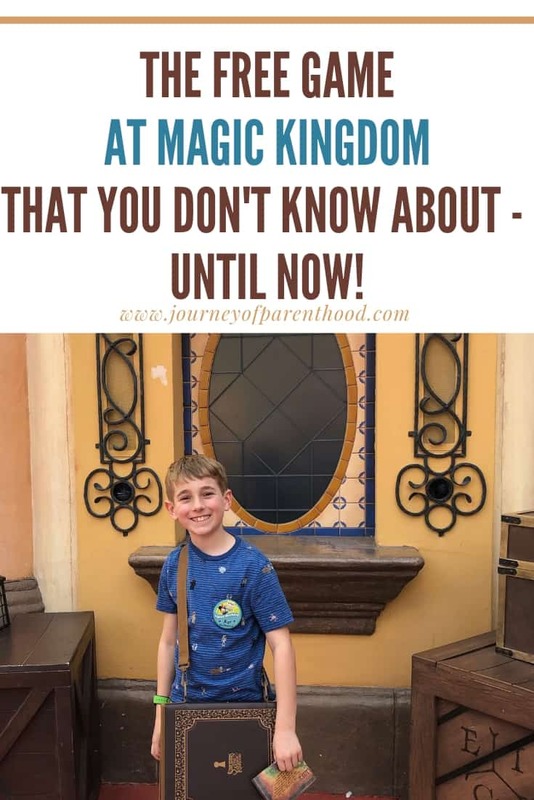 My son and I recently spent an entire afternoon at Magic Kingdom solely focused on learning, understanding and playing Sorcerers of the Magic Kingdom and today I’m sharing everything we learned with you in hopes that you will have the same fun experience playing! 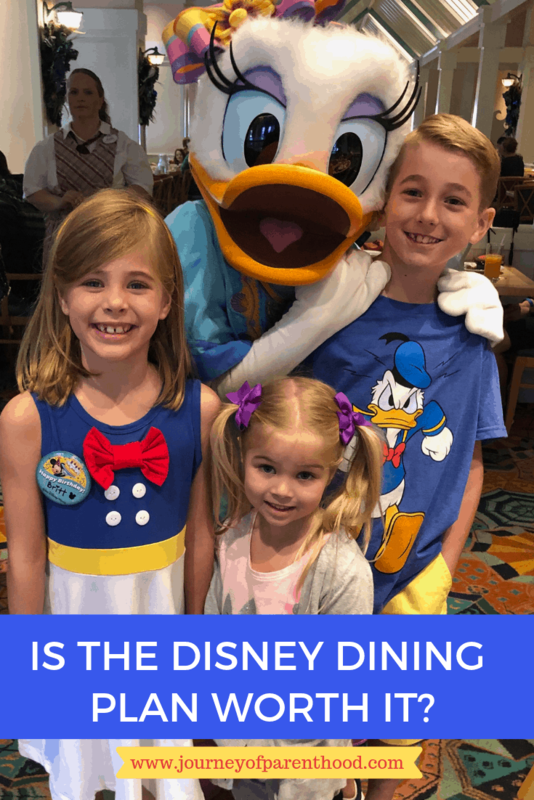 What is the Magic Kingdom Card Game? Sorcerers of the Magic Kingdom is a game played at, you guessed it, Magic Kingdom. 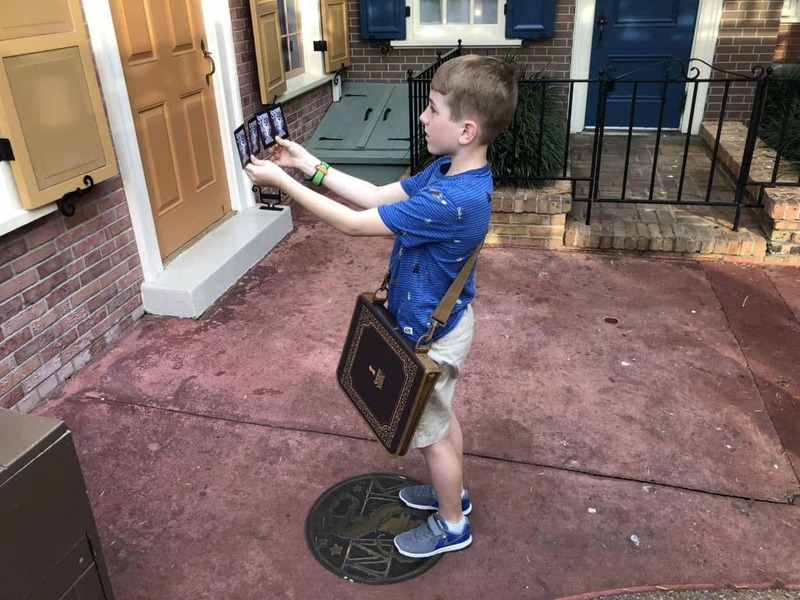 This interactive game is only available at Magic Kingdom park and not at any of the other Walt Disney World Resort theme parks in Orlando, Florida. The game consists of spell cards and takes you through the different lands of Magic Kingdom (Fantasyland, Frontierland, Liberty Square, Main Street USA and Adventureland – the game does not take place in Tomorrowland) on a quest to defeat the Disney villians who are trying to take over Magic Kingdom and ruin the magic for everyone. 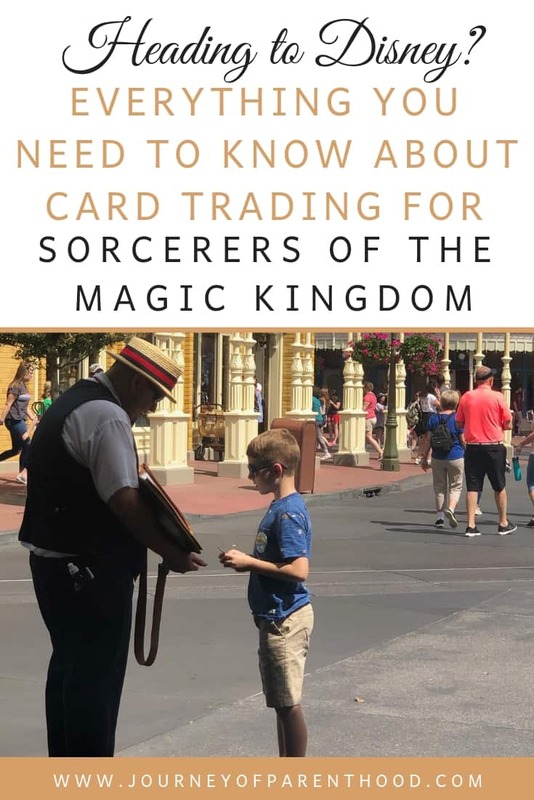 Where Can I get Cards for Sorcerers of the Magic Kingdom? 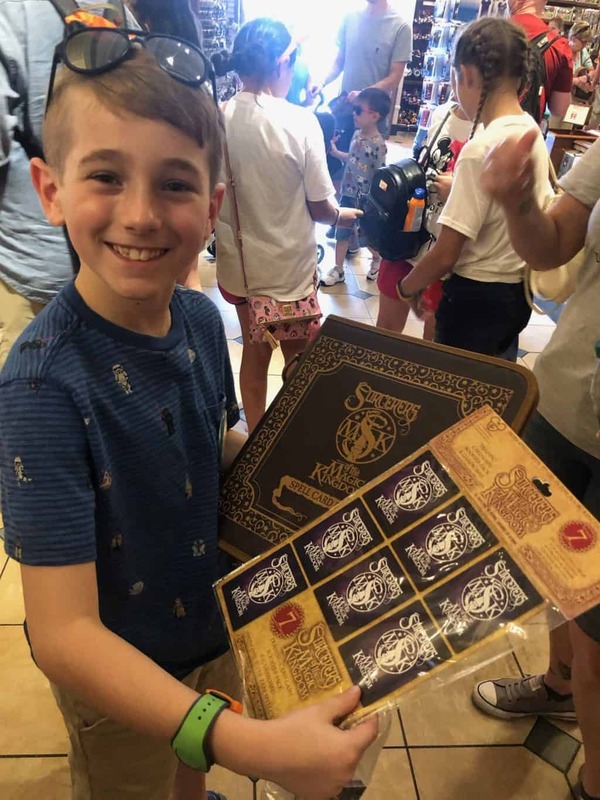 Each time a guest visits Magic Kingdom they are eligible to pick up a new pack of playing cards for Sorcerers of the Magic Kingdom interactive game. 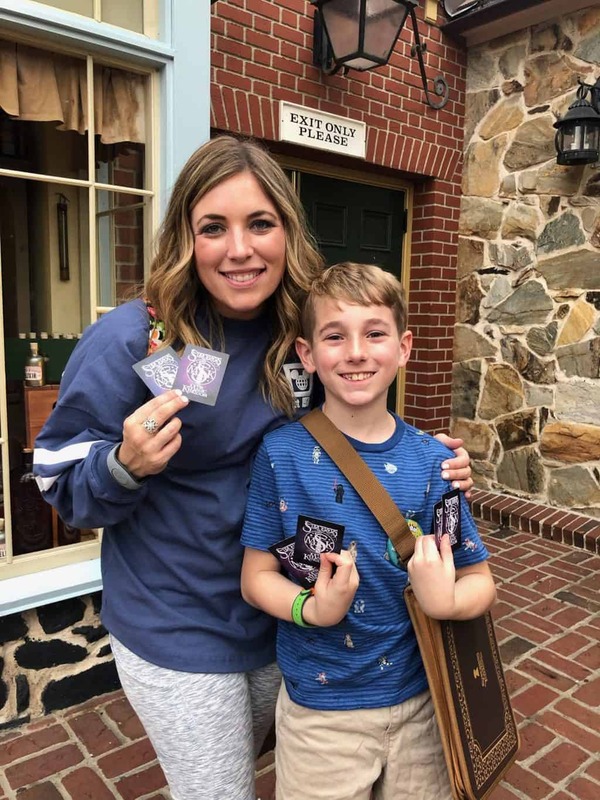 These card packs are given to EACH ticketholder in your party, EACH visit to the Magic Kingdom – meaning that even if everyone in your party isn’t interested in playing (or even if you’re not playing on that particular visit) it’s still worth stopping in and picking up the free cards. 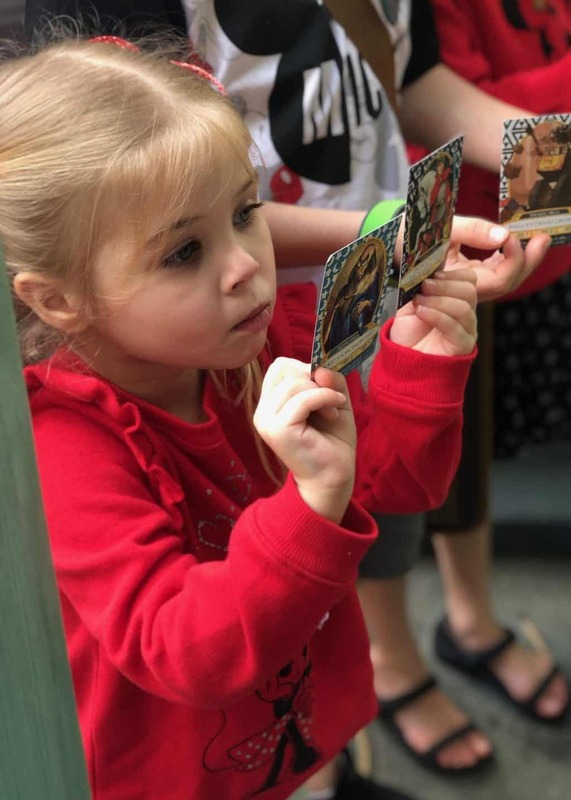 I wish I’d been collecting cards along and along throughout our visits to Magic Kingdom – the cards are unique and fun all on their own, even without playing the game. 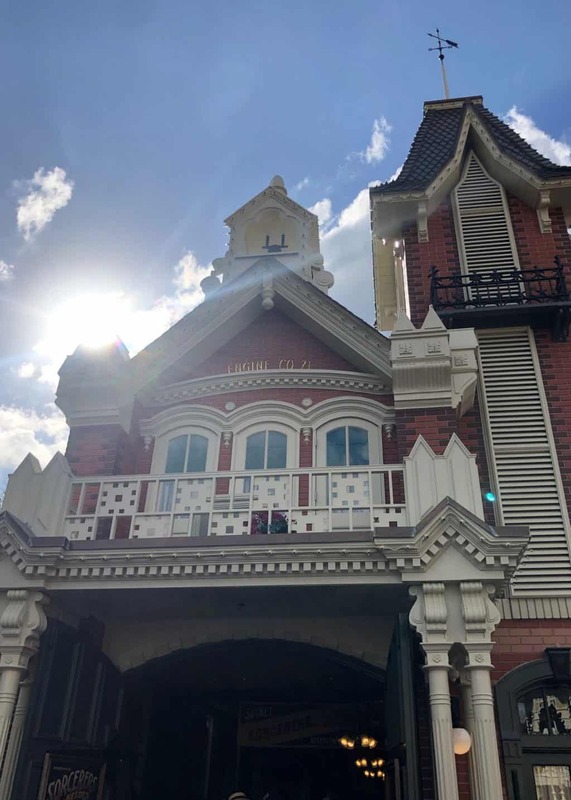 To pick up your cards, and learn how to play the Disney’s Sorcerers of the Magic Kingdom Game for the first time, visit the firehouse on Main Street USA. It’s located to the far left when you enter the park and is one building to the right of Guest Services. This is the main Recruitment Center for the Secret Sorcerers of the Magic Kingdom. There is an additional location in Liberty Square near the Ye Olde Christmas Shoppe. When we visited the second location it was not open so I don’t know how frequently it is closed but did read that it is another place to pick up cards and may be more of a convenient location during your day. 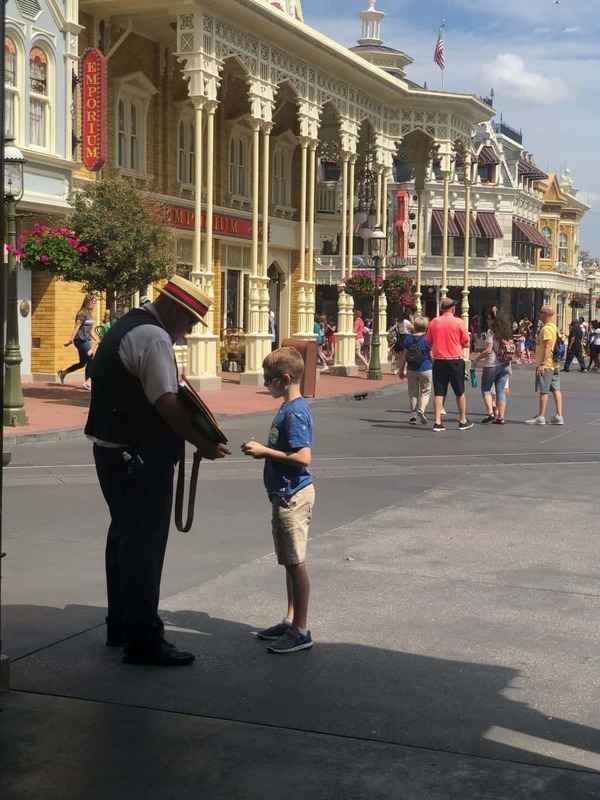 When visiting the firehouse location a cast member will greet you and help you through the process. You will be handed your pack of cards and then have the option to receive a map to help you on your quest. Be sure you have BOTH the Sorcerer Map AND a map of the park. 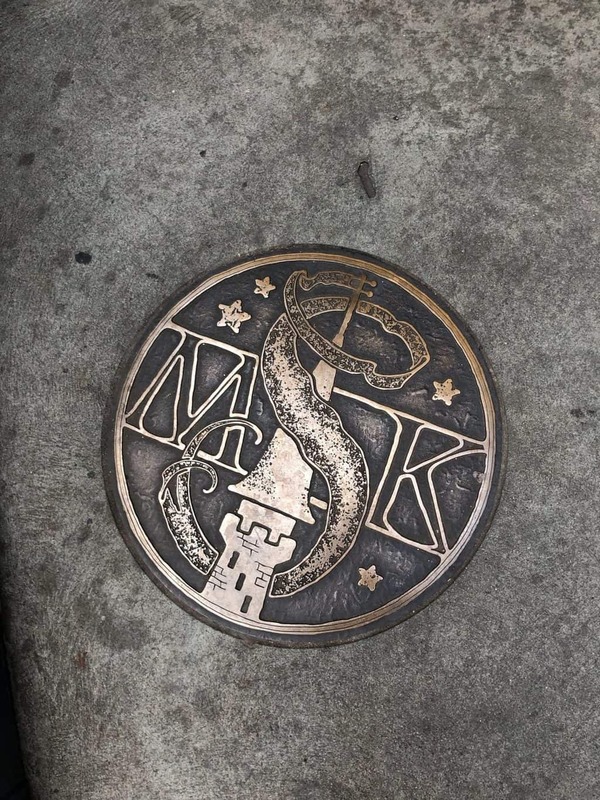 The Sorcerer Map will only show you portal locations and their associated symbols and will not give a good overview for nagivating the park itself ( I was thankful for our park knowledge as some of the spots are a little tricky to find!). If you are a first timer (as we were!) the cast member will also explain how to play the game. 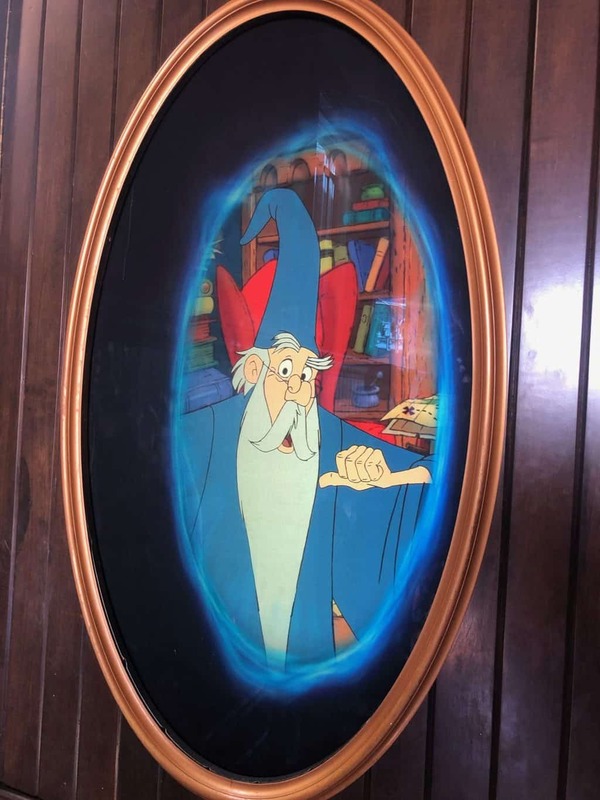 Within the fire station is a portal that gives you a feel for how to play and Merlin (the original sorcerer) walks through the process with you and makes you an official apprentice! The mission of the game is to stop Hades and his villain helpers from taking over the Kingdom! 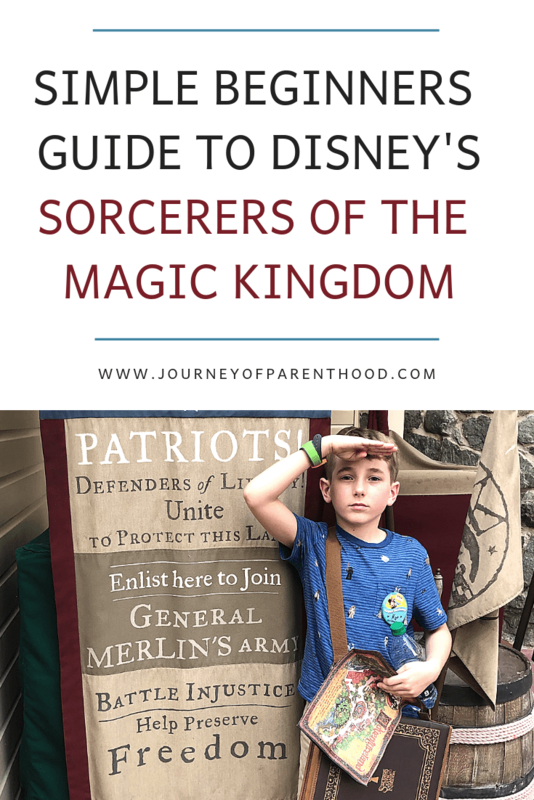 We spent a LOT of our time trying to figure out what the Disney’s Sorcerers of the Magic Kingdom Game cards mean and how the differ from each other. When you pick up your card pack there will be 5 cards in the pack. Remember, you can receive one per person in your party so those cards can add up quick! There are 70 total cards in the game series and each one has a specific number, photo of a character and a variety of powers and strengths. Card collecting is part of the fun and also helps to go further with the game. There are nine classes of spell cards and seven different attack card options. By collecting different cards you are able to combine their powers and strengthen your attacks against the villains. Cards numbered 1-22 are less common (their shape is a star). 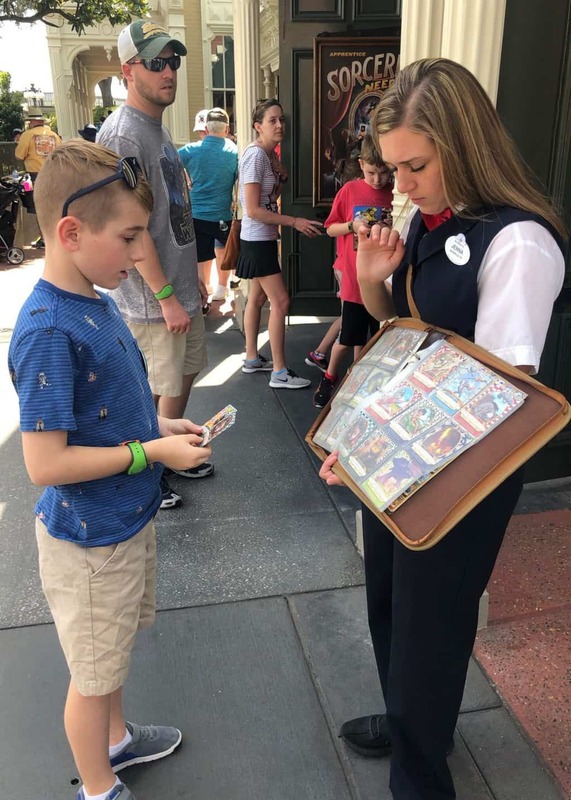 Trading cards is a part of the fun of Disney’s Sorcerers of the Magic Kingdom Game but it’s important to note that cast members will only trade for cards they do not already have in their books. 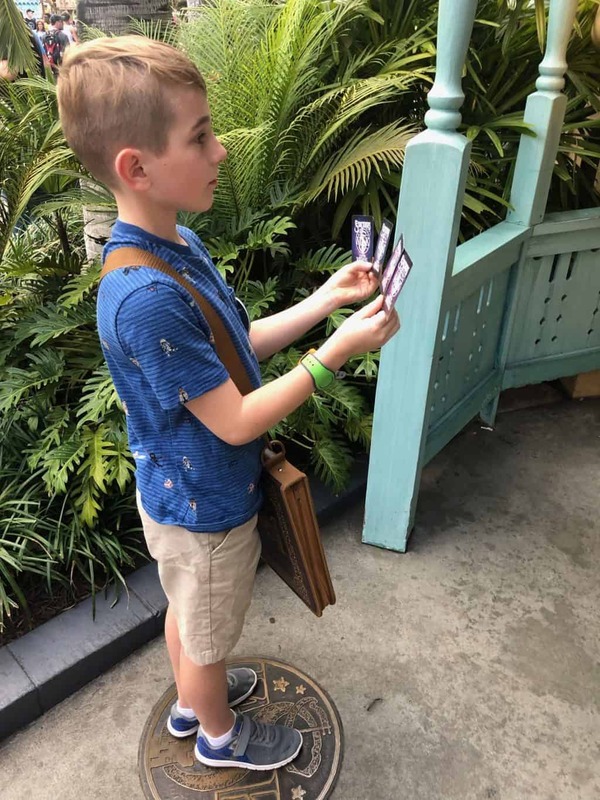 Cast members aren’t commonly seen with trading cards like they are with pin trading. There is always someone at the firehouse to trade with and I’m sure there are trading cards offered at the location in Liberty Square as well! 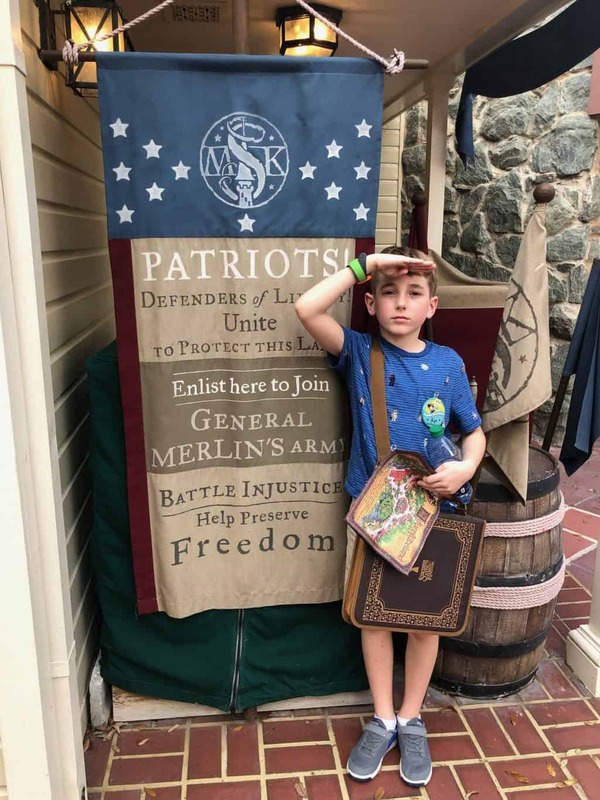 We also noticed cast members at the Disney Vacation Club booths with trading books. Again, it’s one of those things that once you start looking for it – you see it everywhere! So just keep your eyes peeled around the park. A great place to trade cards though is in line for portals. This is a great time to strike up a conversation with other apprentices. 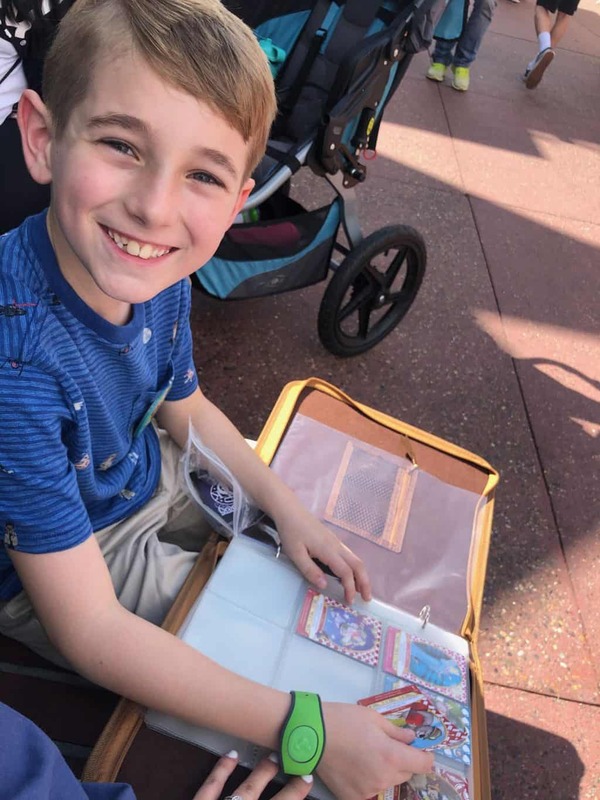 We learned TONS of valuable tips and tricks this way and Kye was able to trade all of his duplicate cards by the end of the day! Plus we enjoyed passing along information we learned with others too. It surprised me how much of this game is a community spirit and a shared love of Disney among players. It’s also important to note that there is trading etiquette when it comes to the cards and their value – only trade cards for ones of equal value or if trading for more valuable cards then make sure the trade is fair by trading multiple lower ranking cards in a bundle. We also learned cards are sold online (what isn’t?) and that trading takes place online as well. So as you collect the cards you may want to sell some and purchase some that route as well! I have also heard that speciality cards are handed out at special events such as Mickey’s Not So Scary Halloween Party and Mickey’s Very Merry Christmas Party so this is something I plan to look more into if/when we attend such parties! Located just a brief walk from the fire station on Main Street is the Emporium. Inside you can find additional items to purchase for the game. These are optional additions but we were thankful we purchased them! The Emporium sells both a great card carrying case as well as additional card packs. These card packs offer cards that are not within the regular rotation of the free card packs at the parks. They include the rarer cards as well as a map, a list of all the cards to keep track as you collect, and a way to play the game at home – including instructions, game board, kye card and additional game pieces (tokens). 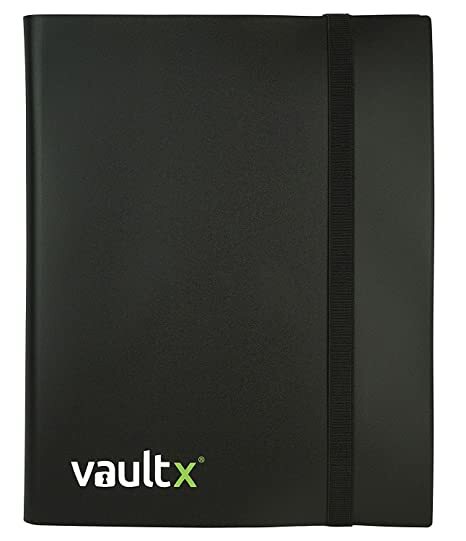 I wish I’d done a little research prior to our day together and had purchased the storage case and an additional card pack in advance. It’s be a GREAT gift and a way to introduce the game and learn about it together prior to playing. Rather than wasting a lot of our play time trying to learn! You can purchase both the card case and the card packs online (I plan to purchase additional card packs as gifts in the future). I linked both below as well as another option for a card case. 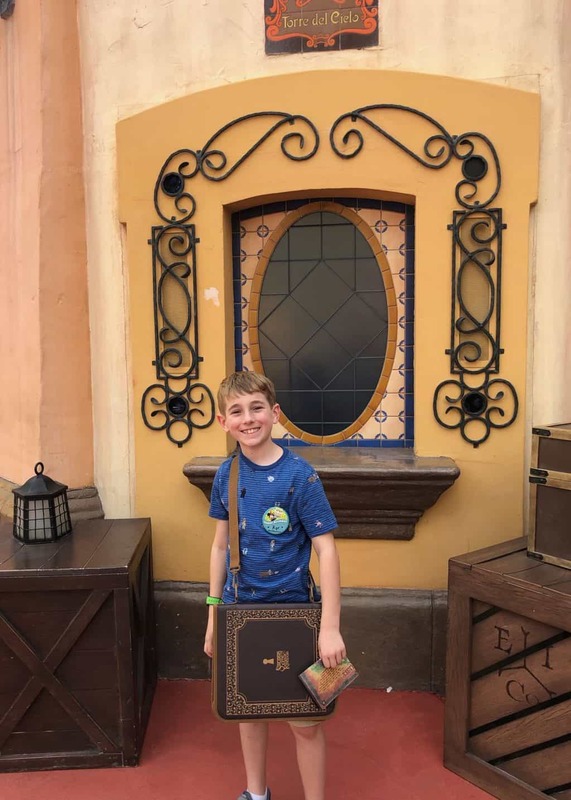 I saw many kids around the parks with cases similar to this one. It’s a much cheaper option and would be easy to store in a bookbag (Kye preferred his larger case as he carried it like a messenger bag over his shoulder). Disney’s Sorcerers of the Magic Kingdom Game is continuous and builds and builds the more you play. So truly it NEVER ends! 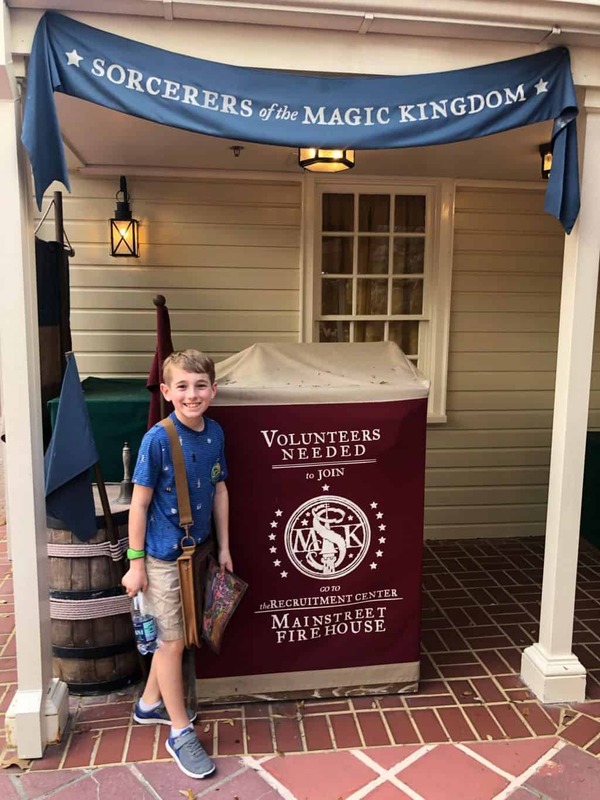 When you first sign up to play you have to choose a player to be in charge (Kye was our choice, obviously) and that player must scan their Magic Band. This makes the game begin and that specific game will forever be attached to that specific Magic Band. 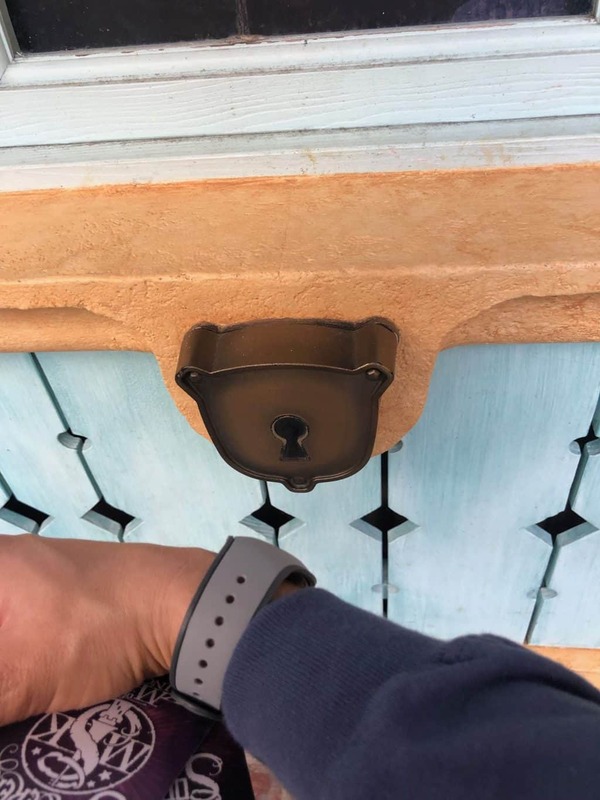 In the past, the game was played using a special keycard but with the new Magic Band technology, it’s now been transferred to band play. When we went through the apprentice initiation with Merlin on Main Street he told us where our mission would begin. From now on our mission will simply pick up where we last left off. It’s a good tip to note: be sure to write down or snap a photo of where you game has left off so you know which portal to head back to when you pick it back up at your next visit. If you forget where you left off, or where you are supposed to be at any point in the game, don’t stress it. Just visit any portal and it will remind you where you are supposed to be! The Sorcerers of the Magic Kingdom Map lays out all the portal locations and each location has its own corresponding symbol. As you visit a portal it will give you the symbol of the next location and so on. It’s very simple to follow for kids of all ages! When you find your first portal stand on the marked symbol on the ground and scan your band to begin play. You will then be shown a video that goes along with your storyline. We learned that the stories become more and more involved the more times you play. It starts off very simple though so you won’t be overwhelmed. A storyline video shows only a story. You don’t do anything during this video other than watch and listen…the first portal in each mission is always a story portal to give you the baseline of that mission. Some portal videos require the use of a shield and which means you will face the card towards YOU and aim the shield of the card at the villain. Other portals will require you to cast a spell which is when you face the spell card towards THE PORTAL and aim at the villain to cast your spell. This is the main play of the entire game and was also the most frustrating for us. We’d be told to “cast your spell” or “display your shield” and the portal wouldn’t pick up our game play. When this happens you have to visit another portal and try again. Which can result in LOTS of walking between portals over and over and can become increasingly frustrating when you think you’re doing all the correct things but the portal just isn’t working. Be sure to stand directly on the ground marking at that portal (the only location we found that didn’t have this marker was the lightning portal in Adventureland). The portal reads the TOP of the card. So when you hold your card be sure not to cover ANY part of the top portion. If you are holding multiple cards at once also be sure not to allow them to overlap. It’s tempting to hold them up in a “fan” type style but this will not work as the overlapping confuses the portal. Hold the cards STILL and CLOSE to your body. It’s a natural instinct to wave them around and hold them closer to the portal, but holding them closer to you and keeping them still works best. If it’s struggling to pick up your spell or shield, slowly move the cards up or down, still not waving them around. More than one person may hold up cards at a time (making the seven card maximum easier to achieve!). The more often you use a card, the more powerful it becomes. Each mission stays within one area of the park and will have you visit each portal in that area. Once you complete that mission the last portal will tell you where to visit to start your next misson. This game can be as casual as you’d like for it to be! You can stop at anytime and the individual missions are rather short (lasting around 20 minutes or so depending on the number of people playing in that area and how accurate you are with casting your spells). Completing the entire Disney’s Sorcerers of the Magic Kingdom Game can take 5 hours. Which I did NOT know in advance and felt bad about as Kye would have LOVED to complete the entire game that day. We spent a good 3-4 hours on it but a LOT of our time was spent learning. Now that we have the hang of it I’m sure future plays will move much quicker. When you complete the entire game (this is when you defeat Hades and save the Kingdom!) 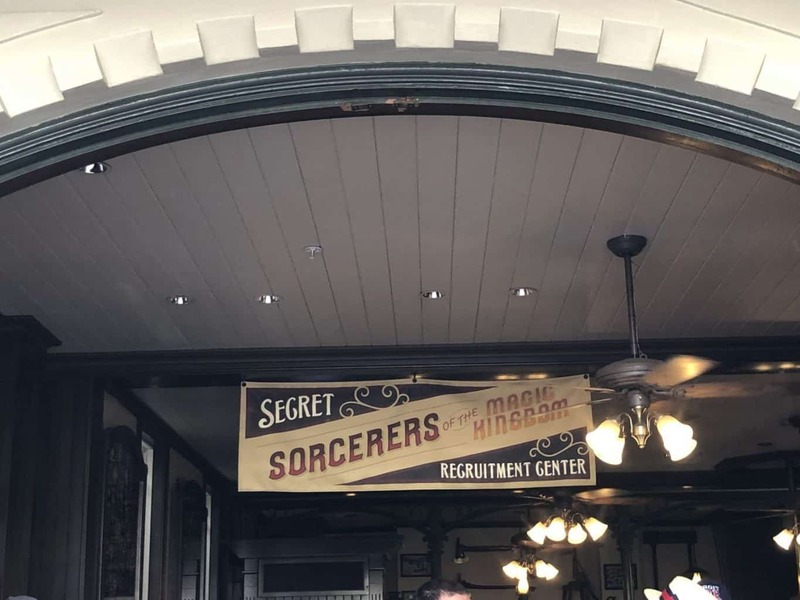 you can check back in at either of the Apprentice Sorcerer locations (firehouse on Main Street or the smaller location in Liberty Square) and pick up a bonus set of cards as a prize. You can also then advance in difficulty in the game. The more advanced you go, the more strategic the game becomes in the combinations of spell cards you use. So much of Magic Kingdom can feel princess oriented and I love that this interactive game is really geared towards boys in a lot of ways. Boys tend to be “gamers” and my son is for sure in that catergory! Kye is ten and instantly LOVED it. It was our first time playing and he couldn’t stop talking about it. He rearranged his cards MULTIPLE times and read through each one and discussed strategies and never wanted to stop. We only rode one ride our entire day at the park! He was so excited to bring his younger sisters to play and they both really loved it as well. 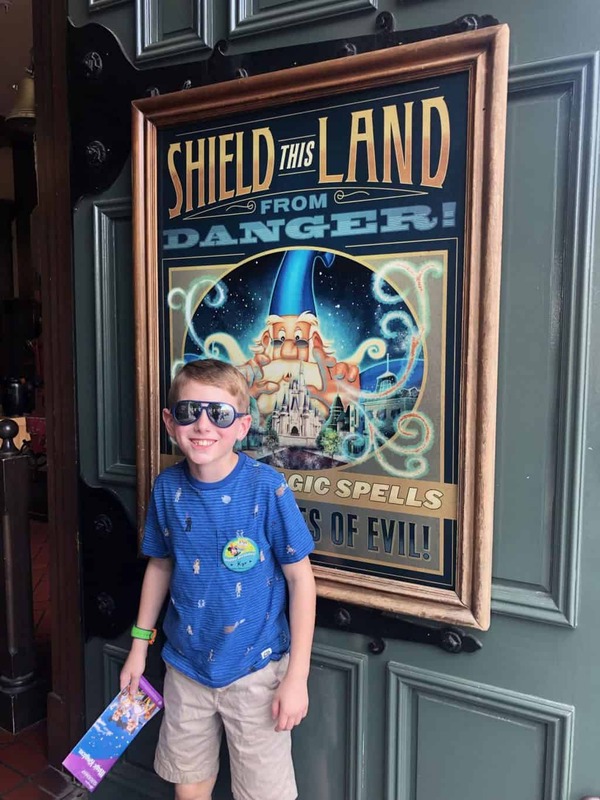 Even our four-year old was upset when it was time to stop and we already have plans to have a Sorcerer focused Magic Kingdom trip again soon. I was surprised by the number of older guys I saw playing the game solo. It truly is one of those things that draws people in and can become quite addicting in the most fun way! However, it’s a WONDERFUL way to enjoy the park in a new way on a future visit! It is also great on crowded days at the parks as it’s not a well-known activity and isn’t a popular park item. So while the masses wait in long lines, you can enjoy your time at Magic Kingdom in a different way! 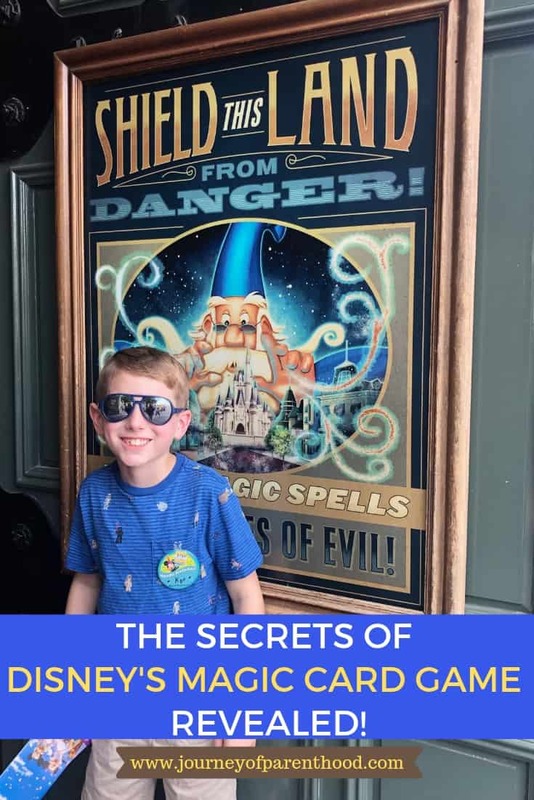 Disney’s Sorcerers of the Magic Kingdom Game is a great family together activity and is a wonderful way to get to explore through all the areas of Magic Kingdom and see the park in a new light. Plus it’s completely FREE with park admission! 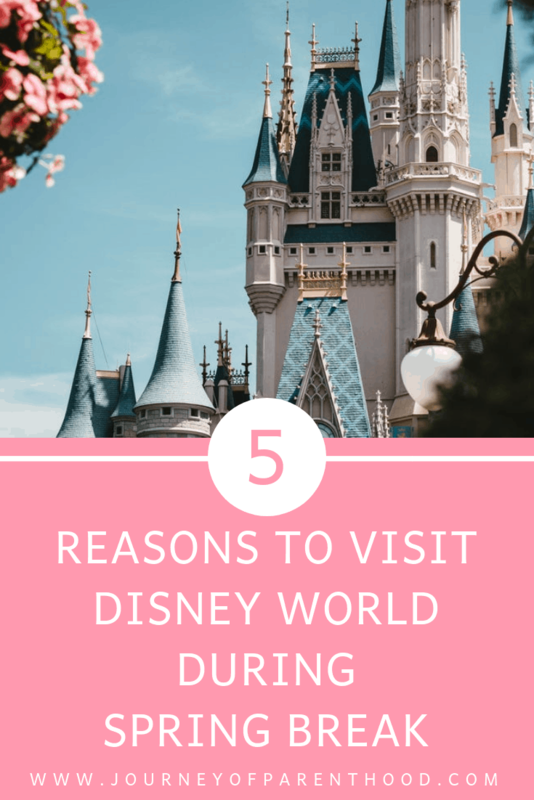 Playing the game together won’t cost a thing and will add extra magic to your Disney memories! We own a 6 bedroom, 4.5 bathroom home 3 miles from the parks in the beautiful gated community of Emerald Island. Our Disney Rental Home has a heated pool and spa, Disney theming throughout and a great game room for the kids. Be sure to visit this post for all the details about renting our home…including the discount we offer to blog readers! My favorite planning tool for Disney is Touring Plans. Being a member of their site allows you access to crowd calendars and daily itineraries to avoid waiting in lines! Learn more here! 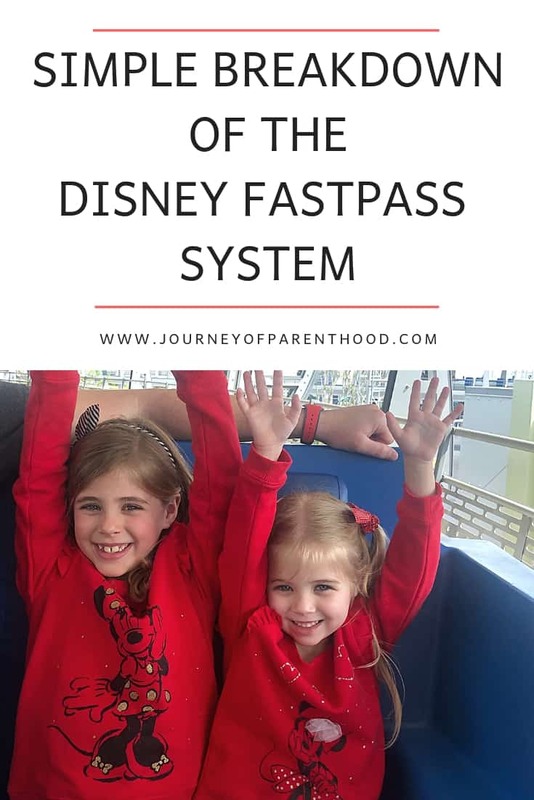 If you’re planning a Disney trip and feel overwhelmed at ALL the things to do and ALL the choices to make…be sure to check out this 28 page planning guide to take out all the guesswork for you and make planning a breeze! Hey I sent the cards I had about a week or so from Canada … hope they get to you ok.